← Urge Seattle council, mayor: Support paid sick leave! In February 2007, San Francisco implemented the nation’s first paid sick days law. It establishes a minimum standard of paid sick leave for all workers within the city. Workers earn one hour of paid leave for every 30 hours worked. Accrual is capped at 40 hours for workers in companies with fewer than 10 employees and at 72 hours in larger companies. 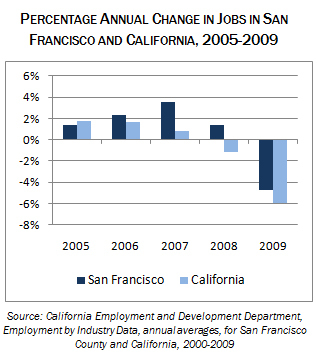 Despite misgivings by some that the ordinance would add costs to employers and therefore reduce the number of jobs, the data show that San Francisco’s job market has compared favorably to the surrounding counties and the state of California as a whole since the sick days law went into effect in 2007. Restaurants are among the employers least likely to provide sick leave benefits, absent such a requirement. Therefore, if minimum paid leave standards affect the number of jobs available, we would expect to see that impact most clearly in the food service industry. In 2005 and 2006, prior to the adoption of paid leave standards, accommodation and food service jobs (which are about 80% food service) grew more slowly in San Francisco than in three of the four adjacent counties. San Francisco’s relative position improved following implementation of the sick days ordinance. The city’s accommodation and food service jobs outgrew three of the four counties in 2007 and all of them in 2008. All four counties lost jobs in 2009. In the 3-county Metropolitan District, which includes San Francisco, and the smaller neighboring counties of Marin, and San Mateo, restaurant jobs grew by 1.3% in 2010, while they continued to fall statewide. This entry was posted in Business productivity, Paid sick days, Policy and research and tagged Paid sick days, paid sick leave, restaurant, san francisco, Small business. Bookmark the permalink.